Out of all the awards shows, I enjoy watching the Grammy's the most. It's always fun and wildly entertaining. But I felt they went a little geriatric this year. I mean, don't get me wrong I love listening to an oldie as much as the next girl, but I felt like it turned into a bad retirement house party. I don't know, it was a little weird. In any case, I mostly tuned in to see the fashion anyway - so let's talk about my favorite looks of the night! Hands down my favorite Grammy look this year was Chrissy Teigen! Her strapless Johanna Johnson dress made her look like a golden goddess. I mean, talk about having flawless skin, this girl!! WOW. Loved the hair, loved the makeup, loved everything! Another favorite was Ciara who looked fabulously pregnant in an embellished Emilio Pucci. She was glowing and proudly showing off her belly all night. So cute. 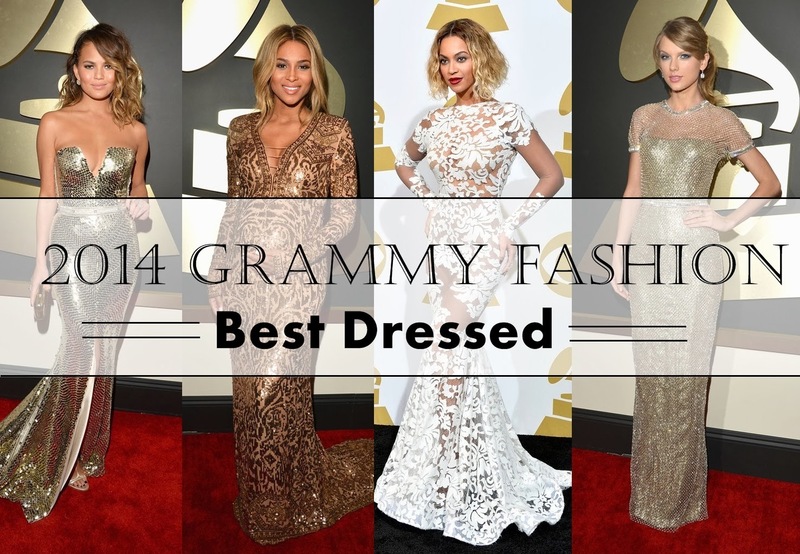 I LIKED Bey's dress, but I didn't LOVE it. The custom white-laced Michael Costello dress left very little to the imagination, and quite frankly I think she could've looked better. I wasn't a fan of her hair and makeup either, but her body is bangin' tho, I will give her that. Taylor Swift looked elegantly beautiful in her gold Gucci Premiere dress, but I felt she played it a little safe for Grammy's. I would've liked her to edgy it up a little bit. I was a much bigger fan of the Alberta Ferretti dress she wore on stage - now, THAT was gorgeous! Finally, I know it's a little random, but my favorite's list wouldn't be complete if I didn't mention Catt Sadler in this stunning Mikael D gown. I caught a glimpse of this on the E! Live Grammy coverage and I'm OB-SESSED. I love Chiras dress, and Beyonce always looks great. The colors here are all quite neutral, I like it! Seems like there was a bit of a theme! Definitely a neutral/metallic theme. Thanks for stopping by! Great picks! My favorite was Taylor Swift she looked gorgeous! Chrissy, Ciara and Beyonce also looked beautiful and I agree about Beyonce's hair and make-up didn't go with the dress. I was SO obsessed with B & T! It seems like they were the favorites of the night. She was absolutely glowing. Pregnancy suits her. Awesome post - I did not watch this show, but will see the highlights when they're on Etv on my side of the world. I think Taylors dress was the show stealer. Simple, pretty, flattering. She looks so classy. She always brings the class on the red carpet.